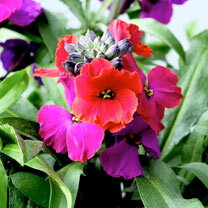 Every garden needs a dash of red, and Erysimum Red Jep will produce a mass of beautiful, fragrant flower spikes. Bushy and compact, these perennial wallflowers are great for attracting bees and butterflies to your garden. The flowers produce an effect of different colours ranging from reds to purple, so you’ll enjoy striking shades in your summer garden. This one looks striking as part of your border and in containers. Flowers May-July. Height 20-30cm (8-12"). Supplied in 9cm pots.